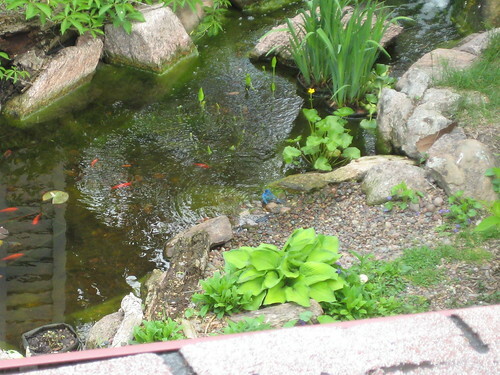 I’ve had to keep refilling the pond every couple of days this spring, and I was worried that there had to be some unfixable leak in it somewhere. After reading this very reassuring article from Aquascape, I had a plan! After filling it up again last night, I unplugged the pump and marked the level of the water (3/4 of an inch above the overflow in the skimmer – guess I went overboard with the sprinkler). 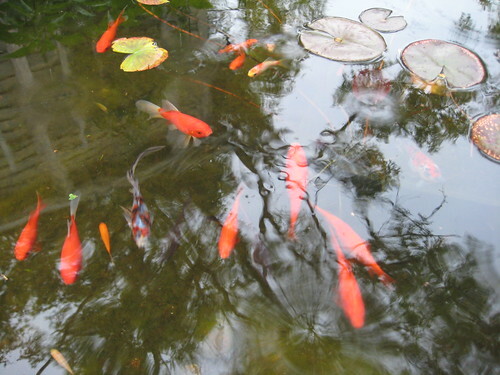 Despite worrying that the fish would be starving for oxygen, they were just fine overnight and through the day. The water level went down to the level of the overflow valve…and didn’t go any lower. Ah ha! 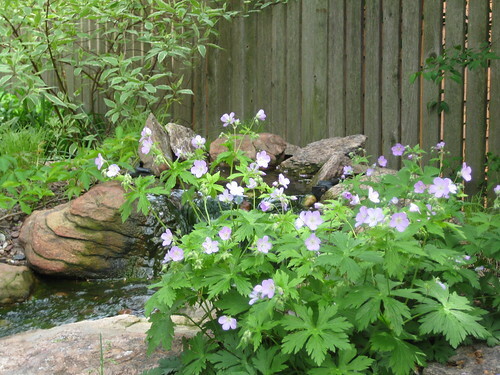 The waterfall and stream will be getting some revisions this weekend, which should be a simple task if the giant rocks lining it can be moved without destroying the wild geranium and Pennsylvania sedge planted around them. The fix itself should just be shoving some extra soil under the liner. 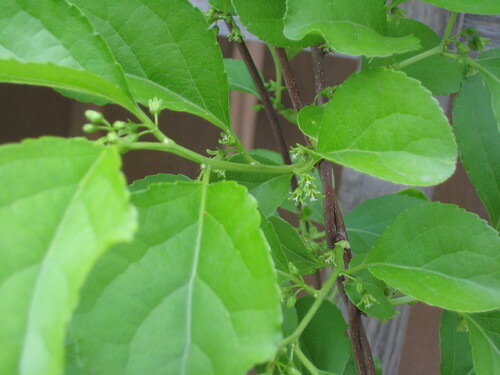 I’m still in the dark about whether I inadvertently planted an invasive bittersweet, but that’s not the only thing going on these days. 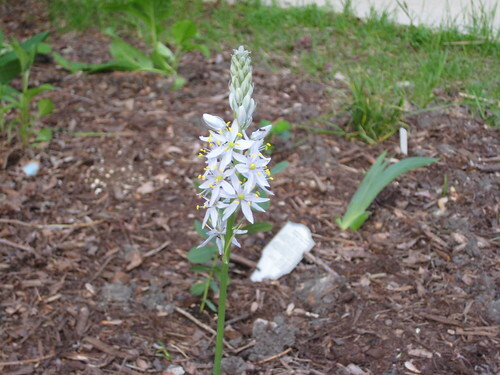 The wild hyacinth (Camassia scilloides) that I got last fall from Prairie Moon nursery is blooming! It’s not as showy as the garden hyacinth that bloomed in early spring, but it’s still an awfully pretty native for the rain garden. The mapleleaf viburnum is making a valiant effort to rebound from being nibbled to death over the winter. I might still keep my eyes open for another plant to put next to it since mapleleaf viburnum does tend towards suckers and shrubbiness, but I’m so glad it survived. Thanks to a sick day, I was able to see the indigo bunting visiting the pond again and snap a photo without having a windowpane in the way. I sure hope it’s nesting in the neighborhood. My lack of botany training is catching up with me. 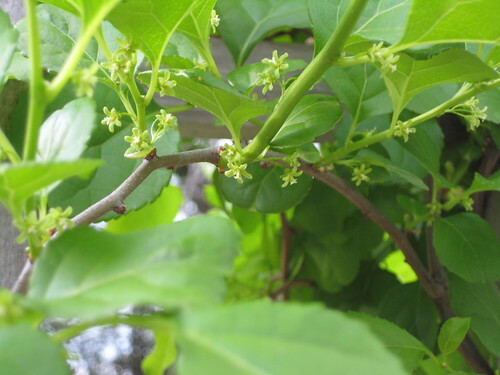 I was so excited that the bittersweet vines have finally covered the trellis and are blooming, but now I’m worried that these might actually be the invasive Celastrus orbiculatus rather than the native Celastrus scandens. Furthermore, what was supposed to be the male plant has flowers that look suspiciously like the (supposed) female plant. I looked for identification guides online, but the terminology is a little dense to wade through. 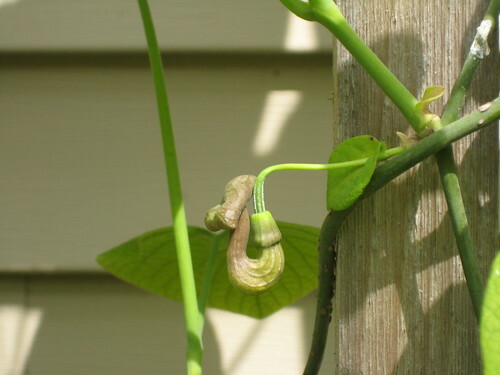 Any pro or amateur botanists out there that can tell me which one these look like, and if these are of different sexes? I’d be happy to add more photos if you can tell me what you need to see. And if you’re not a botanist, I’d appreciate any kind words about how you face ripping out something that finally looks good after 2 years of waiting…. Update: it wasn’t the native. See the proof in my later post. 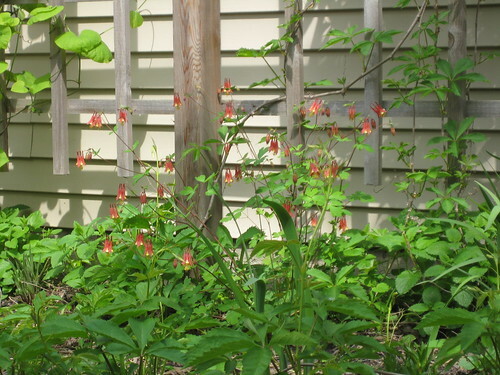 Also, see what native bittersweet flowers really look like. 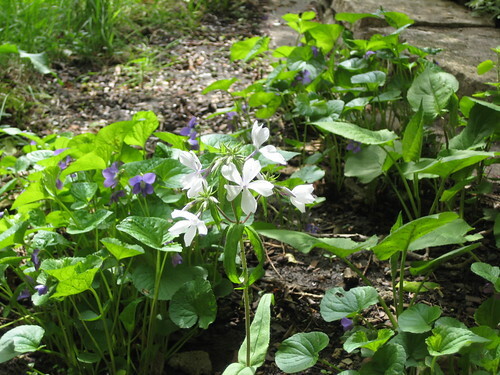 Woodland phlox (Phlox divaricata)- yes, from my “Do not plant” list! 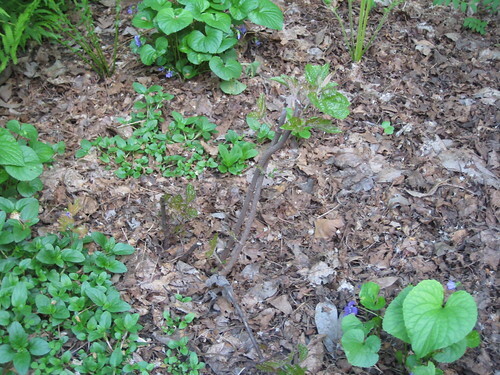 Coming soon: wild hyacinth, Canada anemone, peonies, blackhaw viburnum, and maybe (fingers crossed) American bittersweet. Stay tuned! 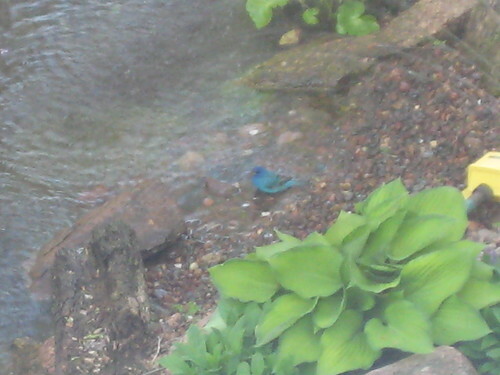 This indigo bunting stopped by to take a bath while I was using the sprinkler to refill the pond. I saw one just about this time a year ago, so perhaps this is a regular stop on its migration route. This shot was from the 2nd floor through the windowpane. 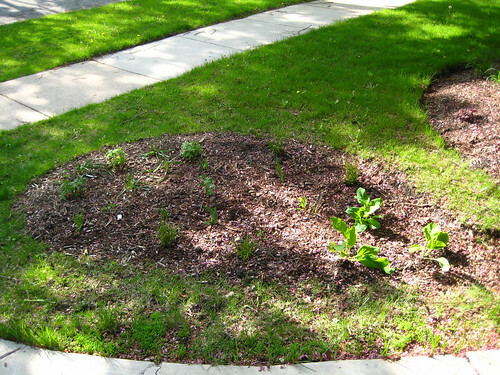 The rain garden I started last summer is finally planted. The plants I put in last fall all came up, and I put in some of my latest Stone Silo shipment as well. If you want to see (nearly all) the plant IDs, click on the image to see my notes. 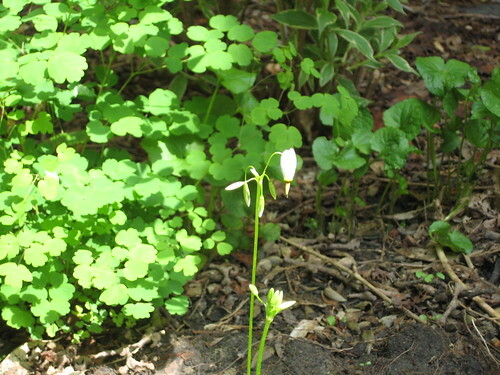 Both the wild hyacinth (Camassia scilloides) and Canada anemone (Anemone canadensis) are about to bloom – I’ll get some closer photographs when they do. 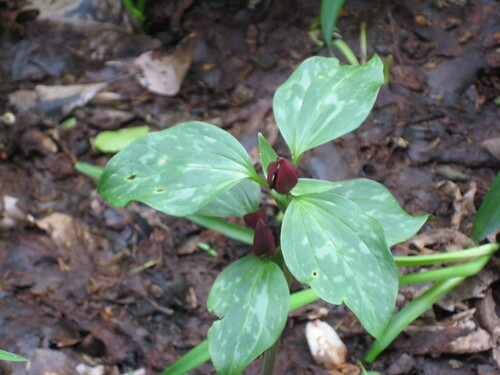 I doubt that the Virginia bluebells (to the right) will bloom this year, unfortunately. I went a bit overboard ordering from Stone Silo this spring – I ended up grabbing at least one of each plant they had that grows in clay and likes at least some shade (and that I don’t already have). 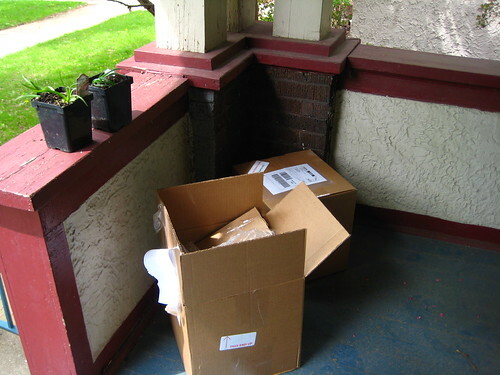 The result was two heavy boxes on the porch this week. All the plants were big and healthy and packed with care, just like all my previous shipments from Stone Silo. 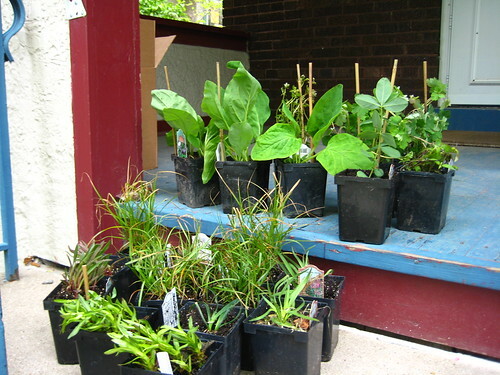 Most of these plants (the Virginia bluebells and white false indigo on the top and the awl-fruited sedge on the bottom, for example) are headed for the rain garden (which I will photograph once we stop having 40 mph winds and heavy rain coming off the lake). 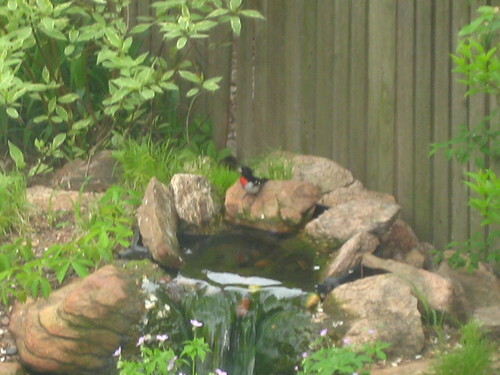 This rose-breasted grosbeak stopped by the pond for a quick drink. I barely had time to get a shot through the windowpane before he flew away.